SHERMAN, Texas — On Feb. 15, 2005, nearly a year after Andre Thomas committed a brutal triple murder that rocked this North Texas town — the stabbing and mutilation of his estranged wife, Laura Boren, 20, their 4-year-old son, Andre Jr., and her 1-year-old daughter, Leyha Hughes — Thomas’ much-awaited trial began. Six days after the March 27, 2004, murders, Thomas gouged out his right eye in the Grayson County Jail. Brown, the prosecutor, said that changed the case. What was already a horrific tragedy became complicated by questions of sanity. Brown and R.J. Hagood, Thomas’ court-appointed lawyer, asked the court to have experts assess Thomas’ competency for trial. The psychologists who interviewed Thomas found he had symptoms of paranoid schizophrenia. Thomas was declared incompetent and sent to the Vernon Maximum Security Unit at the North Texas State Hospital on June 17, 2004. Doctors there were tasked with providing treatment to restore his competency. Forty-seven days later, Thomas was sent back to Grayson County Jail. In a letter to the judge who oversaw the trial, Dr. Joseph Black explained that Thomas was now competent. A report with the letter listed Thomas’ diagnosis as substance-induced psychosis. “It is possible that he may engage in gestures or behaviors, including possibly those involving self-harm, in a bid to appear more seriously mentally ill than he is, and to avoid the consequences of the current charges he faces,” Black wrote. Hagood, who died in 2010, did not challenge the findings at the time. The veteran defense attorney — who was suffering from pancreatitis during the legal proceedings — later conceded that the decision was a mistake. 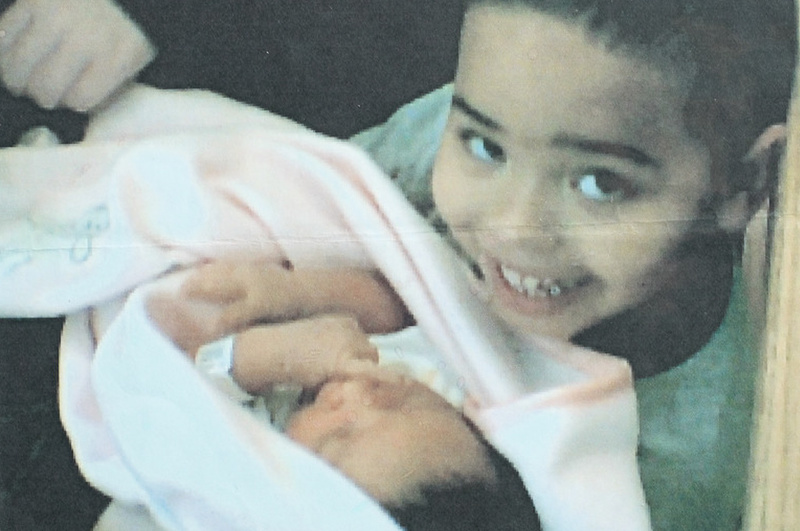 Andre Jr. with his half-sister Leyha Hughes. The standard for competency, which the Supreme Court decided more than 50 years ago, is that defendants must simply be able to communicate with their lawyers and understand their charges. “The system is very skeptical toward the mentally ill,” said Kathryn Kase, the executive director of the Texas Defender Service. That skepticism was on display in the case of Scott Panetti, whom Kase now represents. Panetti was convicted of fatally shooting his mother-in-law and father-in-law in Fredericksburg in 1992. Before the killings, Panetti had been hospitalized at least 14 times for schizophrenia, manic depression, auditory hallucinations and paranoid delusions. He told police that his alter ego, Sarge, was the killer, according to court records. Still, he was found competent to stand trial and allowed to represent himself. He pleaded not guilty by reason of insanity. During his trial, he wore a purple cowboy outfit and submitted a witness list that included Jesus Christ and John F. Kennedy. The jury sentenced him to death. Standards for certifying a defendant competent for trial are too low, Kase said, and experts don’t always make the decision. Often, she said, juries decide the competency of a defendant accused of committing an atrocious offense. Jurors are not supposed to consider the nature of the crime when deciding competency, but Kase said that expectation is unrealistic. Jurors often worry, she said, that if defendants were found incompetent, they would never be held accountable for their crimes and would remain untreated to hurt others. That concern is not unfounded, though perhaps it is less applicable in murder cases. Defendants found incompetent are sent to state facilities. If doctors determine that those people can’t be made competent, under the law, prosecutors are left with a tough choice: wait and hope for restoration or drop the case. If the charges are dismissed, the accused could be released onto the streets. Currently, there are nearly 800 patients charged with various crimes who are in state hospitals because they have been found incompetent to stand trial, according to the Texas Department of State Health Services. A handful have been hospitalized longer than a decade. After the court decided that Thomas was competent for trial, Brown, the Grayson County DA, offered him a deal: If he pleaded guilty, he would be sentenced to life in prison. Thomas told his lawyers that his mother had advised him not to accept the offer. Jesus would take care of him, she had assured him. He pleaded not guilty by reason of insanity, arguing that at the time of the crime he was unaware that his behavior was wrong. The strategy rarely works and was unsuccessful for Thomas. One case in which such a plea was successful was the 2004 trial of Deanna Laney. A 39-year-old Smith County mother of three boys, Laney had stoned her children in 2003, killing two of them and leaving her 14-month-old son permanently maimed. God had instructed her, she told police, to murder her own children. Texas law makes these already difficult cases more trying for jurors and defense lawyers, said F.R. “Buck” Files, who defended Laney and is president of the State Bar of Texas. Lawyers on both sides are prohibited from explaining to jurors what would happen if the defendant is found not guilty by reason of insanity. Jurors are not told that an insanity acquittal in a murder case means that the defendant would probably go to a psychiatric facility and that they would be under court supervision for years, if not the remainder of their lives. “It is grossly unfair to keep this from the jury,” Files said. The law is meant to prevent concerns about potential punishment from clouding the jury’s decision on evidence of the defendant’s guilt. Nonetheless, those worries sometimes affect jurors’ decisions. The law requires jurors to take a leap of faith when finding someone not guilty by reason of insanity, which they did in Laney’s case. 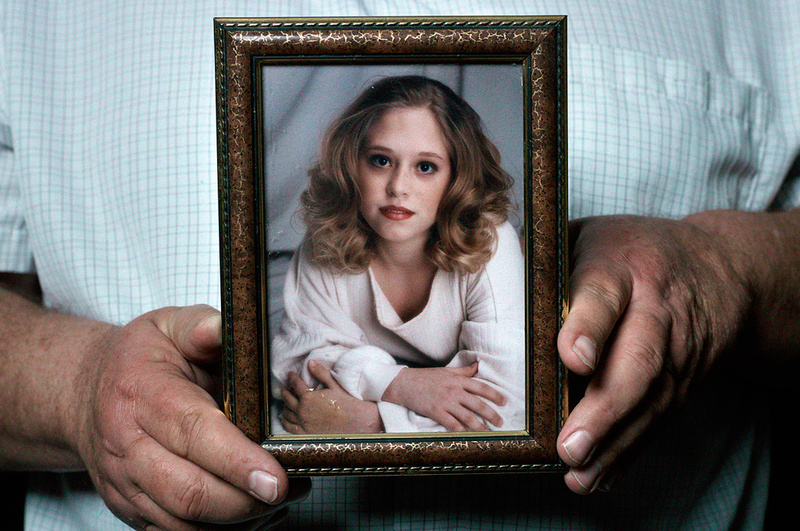 After her 2004 trial, she was transferred to a state mental hospital. In May 2012, a judge signed an order releasing Laney from the hospital, but she remains under court supervision. In Thomas’ case, jurors were unwilling to take a chance. The state’s argument was simple: Thomas was not crazy; his obsession with Laura Boren and his rage were fueled by drugs and alcohol, and he knew what he was doing. “It’s the only thing that he thought he could possibly do in his life to be noticed, and he wanted to be noticed,” prosecutor Kerye Ashmore, who assisted Brown, told the jury. Paul Boren holds a photograph of his daughter Laura Boren. Thomas’ lawyers argued that he had a history of mental troubles, and they presented experts who testified that he was so psychotic at the time of the crime that he didn’t know right from wrong. Jurors returned a guilty verdict. “What worse crime could there be?” Brown asked during the ensuing punishment phase of the trial. “What crime more deserving of the death penalty could there be than the murder of those two babies and this mom?” And after about an hour of deliberation, the jury sentenced Thomas to death. Maurie Levin, a co-director of the Capital Punishment Clinic at the University of Texas at Austin’s School of Law, and Thomas’ legal team argue that he is so insane that he is not competent to be executed, that he isn’t capable of understanding why he is being punished. In 2009, months after he pulled out his second eye and ate it, the Texas Court of Criminal Appeals denied Thomas’ appeal. In a concurring opinion, Judge Cathy Cochran noted that Thomas is “clearly ‘crazy,’ but he is also ‘sane’ under Texas law.” His lawyers have appealed to a federal court. Lawyers for Scott Panetti argued his death sentence was similarly unconstitutional in 2004 as his execution date approached. They said Panetti believed he was going to be put to death to stop his preaching. The 5th U.S. Circuit Court of Appeals held that his awareness of his murder conviction and knowledge of a scheduled execution established his competency. The U.S. Supreme Court intervened in 2007 and ruled that defendants must have a “rational understanding” of their punishment — they must grasp that it is retribution for their crimes. The court left it up to the states to determine what constitutes “rational understanding,” and Texas has interpreted the standard broadly. Panetti’s case is still being litigated, and his fate remains uncertain. But many legal observers believe that the Supreme Court will take up the question of whether mentally ill defendants should be exempted from the death penalty like two other groups, the mentally retarded and juveniles. In a 2002 opinion, the court decided the diminished mental capacity of mentally retarded criminals made the purposes of the death penalty — retribution and deterrence — unattainable. In 2005, the court similarly prohibited the death penalty for those who were younger than 18 when they committed their crimes. Those who believe that the mentally ill should also be exempted argue that they, too, have a limited capacity for reasoning, judgment and impulse control. Questions about how the justice system deals with mentally ill criminals have come into stark focus in the wake of recent mass killings. The deaths of 26 people, including 20 first-graders, at a Connecticut elementary school at the hands of a young man who had previously shown the hallmarks of mental illness are the most recent to force a national conversation about mental health and crime. In cases like Thomas’, where the signs of his mental illness were misunderstood or ignored for years, deciding the appropriate punishment becomes a challenge. Thomas is still at the Jester IV psychiatric prison, and his eyelids are surgically closed. He tells his lawyer that despite his blindness, his life is better than it was at the Polunsky Unit in Livingston. Levin said the fact that Thomas is not suicidal is progress. But he is still mentally ill, Levin said, and should be in a facility that can provide the mental health care he has long needed. Laura Boren’s father, Paul Boren, said that at first, he was conflicted about how Thomas should be punished. As a Christian, he said, he believes in “forgiveness and mercy and grace and all that,” so when Brown, the district attorney, asked how he felt about the death penalty before the trial, Boren said he was in a quandary. “I just prayed. I said, ‘Lord, what would you do?’ As soon as I asked Him, the Scripture came to my mind immediately where he had one of the children, and he had them on his knee and he said, ‘If you harm one of my little ones, it’s better for a millstone to be tied around your neck and cast into the sea,’” he said. “At that point, I was fine with it.” Boren said he believes much of Thomas’ mental illness is a charade to escape responsibility. “I honestly hope and pray that he gets what he deserves here on Earth, and I hope he gets right with God,” Boren said. 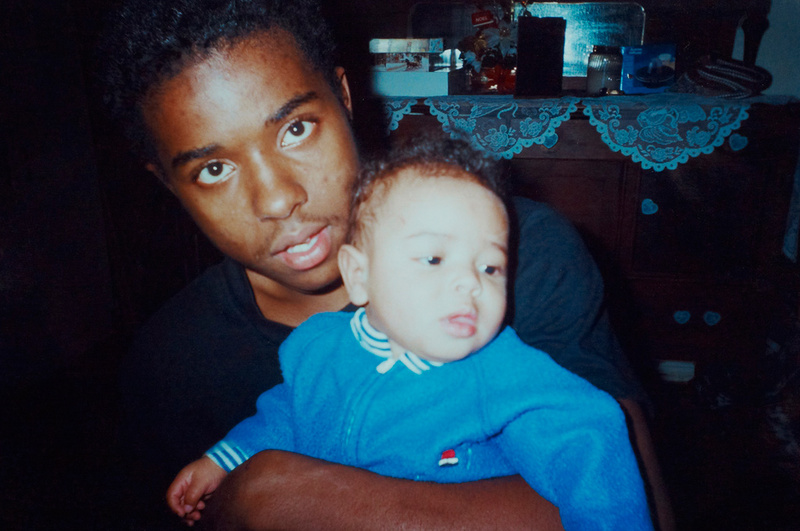 Andre Thomas with his son Andre Jr.. While he awaits a decision on whether he is competent for execution, Thomas told Levin recently that he fills his days in prison with dreams of things he’ll never be able to see or do again. He mimics the sound of a car and moves his hands like he was steering and shifting gears. With his medication, Levin said, Thomas seems almost sane. It’s easy for her to forget just how sick he is. Then, she asks him if he knows why the state wants to execute him. This story is part of a collaboration with Texas Monthly magazine. 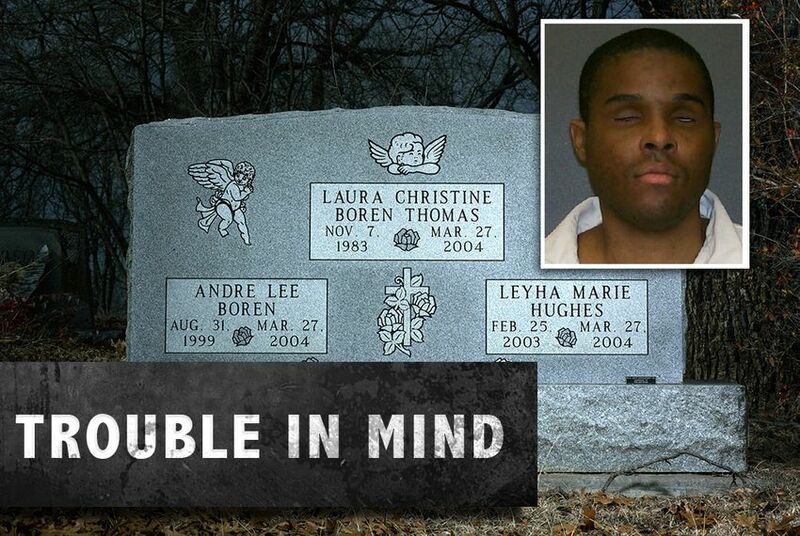 Read the long-form narrative tale of the Andre Thomas case here.